Most major theme parks have their own “kiss goodnight” – an end-of-day spectacular of some sort designed to keep people around until after dark. Universal Studios Hollywood finally has theirs – The Nighttime Lights at Hogwarts Castle. When The Wizarding World of Harry Potter opened at Universal Studios Hollywood in April 2016, media and VIPs attending the grand opening party were treated to a stunning projection show on the Hogwarts facade, featuring a live orchestra conducted by John Williams, accompanied by fireworks behind the castle. When all was said and done, many of us in attendance agreed that it was the best projection show we’d ever seen, and that it absolutely needed to become a nightly occurrence in Hogsmeade – minus the orchestra and legendary composer, of course. A new after dark spectacular is coming to Universal Studios Hollywood’s Wizarding World of Harry Potter this summer: The Nighttime Lights at Hogwarts Castle! 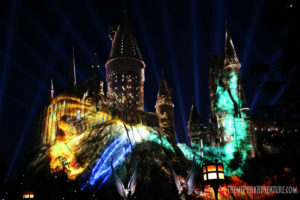 Following the incredible grand opening ceremony of The Wizarding World of Harry Potter in Los Angeles last spring, fans have been begging for a similar nighttime projection show to be brought back to the theme park for everyone to enjoy as Potter’s own “kiss goodnight” each evening. Guess what? Universal listened. Beginning June 23, 2017, guests visiting Universal Studios Hollywood will be treated to a spectacular projection show on the Hogwarts exterior several times each night, after the sun has completely set and it’s dark. 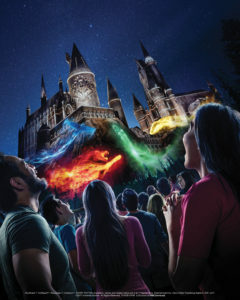 According to Universal Studios Hollywood, the Nighttime Lights at Hogwarts Castle show will showcase the four houses of Hogwarts: Gryffindor, Ravenclaw, Hufflepuff and Slytherin, with a finale of a fan of lights beaming upward into the night sky. The dazzling visuals will be accompanied by a brand-new state-of-the-art sound system that has been installed in Hogsmeade, as well as other special effects surprises that will “wow” guests viewing the spectacle. It’s the stuff of dreams, really: Universal announced today that The Wizarding World of Harry Potter in Orlando would receive an extensive Christmas holiday overlay at both Hogsmeade and Diagon Alley. 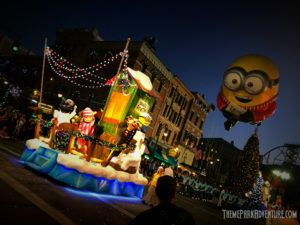 Since Universal began rolling out their Wizarding Worlds, fans have been begging for a Harry Potter Christmas celebration, which would transform both Hogsmeade and Diagon Alley into holiday spectacles, even more enchanting than they are already. 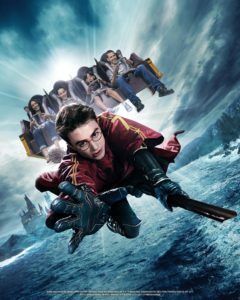 Between November 18, 2017 and January 6, 2018, visitors to Universal Orlando Resort are in for a huge holiday treat as both theme parks – Universal Studios Florida and Universal’s Islands of Adventure – are transformed into a winter wonderland with all the sights, sounds, and sweet treats that come with an epic Harry Potter Christmas celebration for the whole family!